I want to take 38 seconds and applaud the Church of Jesus Christ of Latter-day Saints for their support of laws that would protect LGBT people from discrimination in areas of housing, employment, and services. This is a good step in the right direction to not only do the right thing, but also to repair relationships with the LGBT community and allies. I said 38 seconds because that is the time I calculated that was spent in actual support of non-discrimination laws during the 19:43 long "news conference." Unfortunately, the Church’s support rings hollow. 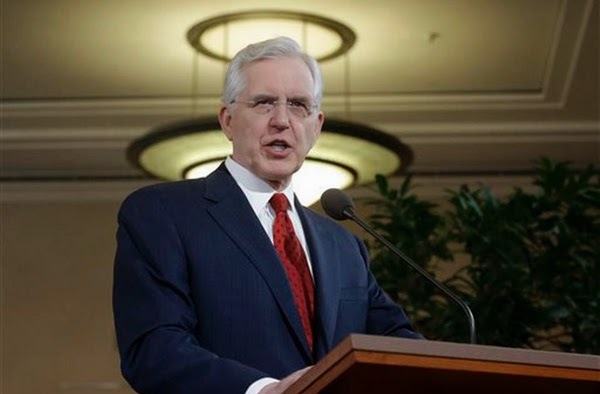 Nowhere in this "news conference" was any real concern expressed for the LGBT community and the persecution they continue to face today (except for maybe 6 seconds when Sister Neill F. Marriott acknowledged that there have been centuries of persecution and violence against homosexuals). Instead of concern, we got a 19-minute-long general conference talk about our Mormon Persecution Complex. Instead of an impassioned plea to treat all of God's children with fairness, we got an unabashed plea to treat everyone fairly, so long as there are loopholes in which we can then not treat everyone fairly. Instead of a call to build a stronger relationship between the Church and the LGBT community, we got a call to stop persecuting us for persecuting you. It's been pointed out that some of the examples used by Elder Oaks meant to show the supposed rise in persecution of religious people are really not all that they are cracked up to be. But they are certainly catchy examples to push the idea that it is not LGBT people who are the victims here, but us, the noble God-fearing folks. I want to be happy about the Church's 38 seconds of support for non-discrimination laws. But when those 38 seconds are surrounded by 19 minutes of ifs, ands, or buts, I find their support disingenuous at best. Non-discrimination laws are meant to protect people's access to housing, employment, and services. But if our understanding of the Gospel allows for "those with strong religious convictions" to refuse housing, employment, or services to people because their life doesn't conform to our beliefs, then maybe we're failing at understanding the Gospel.